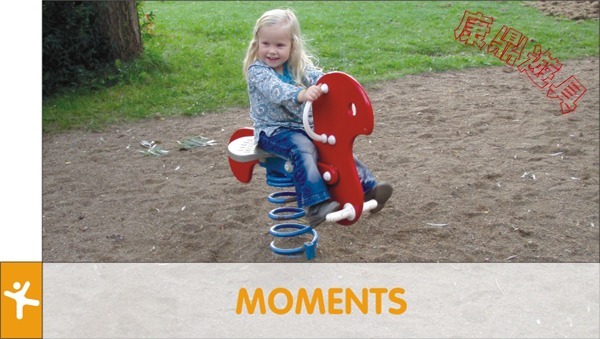 More than 35 years of commitment to children's play go into the making of MOMENTS products. MOMENTS offers a choice of materials to meet individual needs for strength and durability. Needless to say, we continue to develop new themes and activities to create playful environments in the future. The main materials are based on FSC certificated pine posts and include HPL floors and steel in-ground footings. Together with the combination of modular plastic slides, steel slides and rubber features, MOMENTS is classic, yet creative. In a world built for grown-ups, MOMENTS offers a special place just for toddlers to explore, create and discover. When you consider that the first few years of play shape the rest of our lives, the play environment is crucial. MOMENTS combines clear colours with soft and friendly shapes to make a simple statement: "Come play with me!" Traditional activities such as sliding, swinging and wobbling appeal especially to toddlers and younger children. The clear and bright colours of MOMENTS are chosen to signal warmth and comfort but also to support spatial awareness and signal play to children. The preschool MOMENTS products gather together some of our best known play equipment to address universal play themes and create space and enjoyment. Items with a clear theme such as trains, ships and castles are a great inspiration for children's imaginative and role-model play. They provide the opportunity for exactly the type of shared or individual play that helps develop basic, yet fundamental life-skills. The classic post and platform system of MOMENTS: it offers a wide range of activities including climbing, balancing, sliding, swinging and spinning, along with creative frames for play, movement and challenge. Moving from one activity to the next involves time spent on the platforms and towers. From these vantage points the children can take a good look at the next challenge facing them and can take a well-earned breather, chatting to the friends around them. The bridges and nets are open, encouraging, and most important of all, challenging.